Preheat oven to 400 degrees. Coat a baking sheet with cooking spray. Place potatoes on the baking sheet and toss with oil. Roast 25 minutes. While the potatoes are roasting, place basil, spinach, Parmesan, nuts, garlic, salt and pepper in the bowl of a food processor. Turn on low speed and drizzle olive oil in through the vegetable shoot until desired texture is reached. Taste and adjust seasoning, if necessary. 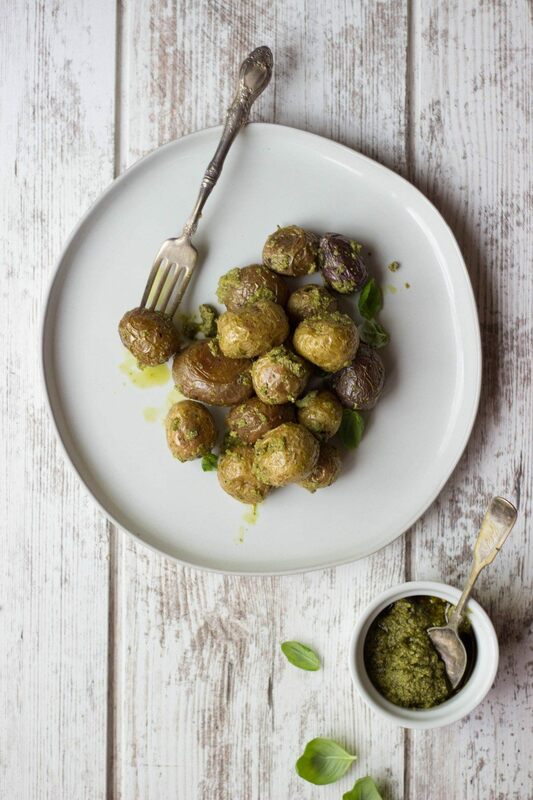 Pull potatoes out of the oven and toss with pesto sauce. Roast for an additional 5 minutes, until potatoes are fork tender. Serve potatoes with chopped basil and Parmesan cheese, as desired.